T4 Multi Layer Stainless Steel open gasket. Hi Performance Turbocharged Engines require a better than average sealing system. Source Automotive will not accept better than average. We had these gaskets made to our specifications to insure a premium grade, top shelf product. We need to keep exhaust flow in the path which we choose. You should too. 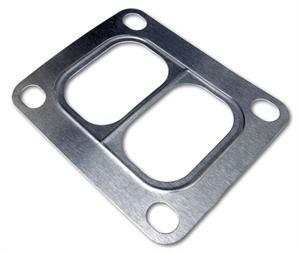 Multi Layer Stainless Steel Turbine Inlet Gasket for all T4 based turbochargers. This gasket is a divided design. Singularly priced @ 13.50 each.